Every track has them once in a while. This is where a player bets a HUGE amount of dough on a very big favorite. The ones that go off 1-9, and have to pay a minimum of $2.10 to show….. If you can get a nickle on a dollar from the bank, you better go get in line…… At the track, we like to see wagers, but among the players they are known as Bridge Jumpers. If that $20,000 goes down, the line on the bridge could get awfully crowded. At River Downs, a big time owner with deep pockets by the name of Billy Hays is ITM 71% of the time. His runners are almost always the chalksters. He gets them from California, and he wins like it is going out of style. Perry Outzs is his go-to rider, and Mr. 5,000 will be sure to make it t0 6,000 in the next year if this trend continues. We have been seeing so many HUGE show wagers it is incredible. How about $3,200 in the win pool, and $50,000 in the show pool? There have been a few occasions that the show pool is closed. The tracks that take that bet run the risk of having a minus show pool. This is where you payout more money than you take in…The host track, or River Downs in this case, is not the place. The 90% of our outside wagers have been coming from other sources. So, we do not take the hit…. They do for taking the wager. 5%….. A nickle on a buck…. If you go to First Federal and get 1-1/2 %, you are lucky… Now, a 6 horse field jumps up, and you get a 5% break…. If you wager the $50,000, you get back $52,500. A profit of $2,500.. Not bad for a 1:13 worth of sweating bullets….. I tried to get quality road off the board and made a nice size show bet on blame. It didnt happen the way i wanted but we all have seen the 30.00 show prices when 1/9 runs out. Why is the incidence of bridge jump betting increasing. Way back in 1996 is when I first tried bridge jumping. I had won 21 straight bets and some were at tracks that paid 2.20 to show so 10 cents on the dollar really is huge. What happened to me is I started to get risky with larger fields along with some horses that were not prohibited favorites. I felt like I was on a drug and I had to find at least 1 winner a day. That is where the big mistakes are made. If you have self control and stick with the fundamentals of then chances are you might beat the odds however I have seen total standouts 1/9 shots not finish in the money and yea I wanted to jump off a bridge.I even had a disqualification at Belmont of a 1/9 shot who won and was placed 4th. 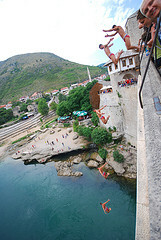 I had gone back and forth on and off bridge jumping until 2003. Everyone talks bad of the Bridgejumpers. But no one publishes the percent of Loss vs Win. Just opinions and guesses. A bridgejumper can lose bets. But as long as he Wins more money than loses, he is ahead. What is the ratio of Win vs Lose? I have not seen the official P & L of wagering. From my experiences working at three tracks, many want to be unnoticed when they make a HUGE wager. Hence, why the reason more folks go off-shore for rebates and special benefits. You tell me: – If you wager $1,000, and look to make a $100 on the bet. The 10% is sweet. But, is the wager worth the reward in your opinion ? – I guess it all depends on your ability, and if you want to live on the dangerous side of the tracks. The comment right above tells a tale of one player.